FinancialAid.com just sold at the Moniker TRAFFIC auction for $800,000. The auction is showing strength in my opinion, although some great names have passed at over $1mm – including a pair that sold for $3,000,000 at the last auction in New York. Also included in the sale is FinancialAide.com. The financial aid industry is in really bad shape. Congress recently passed a law that severely restricted (highly profitable) private student loans, and I know for a fact some fo these companies are struggling. Solid research, Elliot – this is a particularly interesting sale given the situation in the lending market. Just as Berkshire recognizes equity opportunities in this downturn, it appears there are some smart domain investors who will build out premium financial generics. I just can’t believe that totallyconnected.info didn’t hit the $1mm reserve…. that had to be a bet monte lost to put that in there. Girdon, why are student loan companies suffering ??? What’s your take on the legitimacy of these bids? I’m thinking a number of these online bidders are having a little fun or something. That said, I do hope the bids being made on two of our domains are from legitimate buyers. Time will tell, of course. FinancialAid.com sold several years ago for $600,000 to three hustlers that tried to put a business together…. I guess it did not work out. –Where is the list of other stuff that sold? I hear you – it does seem like those bids in the online extended aution are out of line with what transpired in all the live auctions. Like many of us, I have participated in Snapnames auctions where the winning bidder has reneged on payment. Those bidders, as far as I know, never suffer any consequences. In fact, I read a thread on Namepros where one domainer was tracking the non-payer in other SN auctions, and he subsequently bid again, and subsequently did not pay again. And did not suffer any consequences (that anyone knew about). You’d think they’d cancel his account immediately and block any attempt to re-register. That is my concern with the extended online auction. All one needs to be eligible to bid in those auctions (operated by Monker) is a Snapnames account, and have a credit card on file. That doesn’t mean the bidder’s credit card has a credit limit of $800,000 (or more) (whose does?) – but they can sure put in the bids if they want to. I believe that come next Thursday if the majority of the extended online auctions have huge bid amounts like those listed above, we will see 50-75% of those domains “sold,” but the seller will never see any money. And for that, Monte and the boys will have some ‘splaining to do. Nice move, Mike. Looks like you got out when the getting was good. FinancialAid.com $800,000 good work Monte – I thought the auction was a good result. The move to generics will grow as the financial sector struggles. The demand for generics as an advertising medium will soar as business see the potential and power of generic directory domain names. mike o’brien, whats your take on the current price of financialaid.com domain name and its future value potential ? Guys, these prices on on the domains at SnapNames aren’t the actual bids. They are the reserves. It shows bids because people bid for the domains prior to the auction actually starting, so their bids were accepted but are below the reserve. 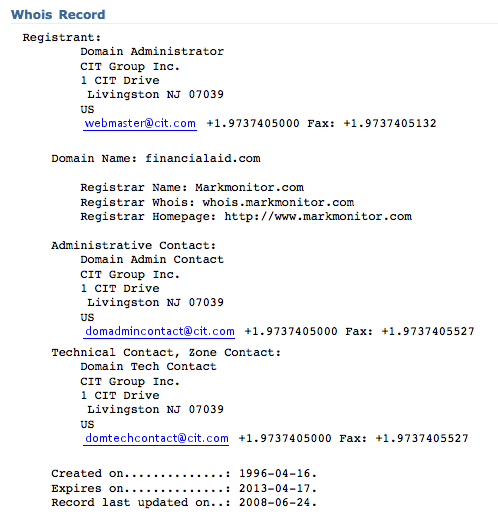 I own FinancialAide.info and will consider selling this domain in the future. I think you will be hard pressed to sell a typo .info.